In case you weren't already aware, blueberry and lemon are best buds. They should always hang out together, because they are a dynamic duo. Sweet blueberries against the tart freshness of lemon - it just doesn't get any better in my book. I call this a breakfast cake, because I more often than not eat this at breakfast or lunch. Really, you can eat it anytime. No one's going to stop you! For the dry base of the cake, combine almond flour, oat fiber (not oat flour - there is a difference), whey protein isolate (for a protein kick), baking powder, salt, and Pyure or THM Gentle Sweet. I used both oat fiber and whey for two reasons: 1) I wanted to give the cake a sturdy texture and 2) I wanted to tone down the sometimes aggressive flavor of the whey. For the wet base, combine the almond milk, vanilla, melted coconut oil, zest of 1 lemon, and juice of 1/2 the lemon. Combine the two bowls of ingredients, whisking until there are no lumps. Next, prepare the blueberries. I used frozen berries, because it's what I had on hand but you could use fresh if you like. Combine the frozen berries with 1 Tbsp of coconut flour and toss them together. Prepare an 8x8 baking dish with coconut oil spray and a square of parchment paper in the bottom. Pour the batter in, and bake at 350 for 30-40 minutes. As you can see, the top of the cake doesn't brown as much as the sides. Make sure you look there for doneness first, and check the middle with a toothpick start around 30 minutes of bake time. It's OK if it puffs a little, it will reduce as it cools and you can (gently) press it back down if needed. Let the cake cool completely, then prepare the glaze. Beat together the cream cheese, Pyure or THM Gentle Sweet, lemon juice, and vanilla until the mixture is slightly fluffy. One tablespoon at a time, add the almond milk until the mixture is thick, yet pourable. Pour it right over the top of the cake, letting it go down the sides and wherever it pleases. Just gently spread it with a spatula so that all sides are evenly coated. Serve immediately, or refrigerate for future use. 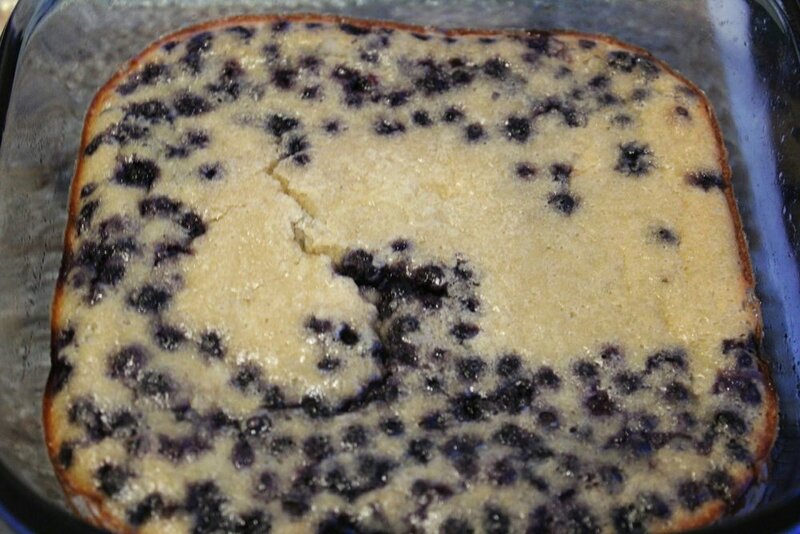 The cake is perfectly moist with tiny bursts of blueberry throughout. The glaze is smooth, velvety, and zesty with the fresh lemon. It's the perfect breakfast or snack time pick-me-up.